rquery is a piped query generator based on Codd’s relational algebra (updated to reflect lessons learned from working with R, SQL, and dplyr at big data scale in production). rquery is currently recommended for use with data.table (via rqdatatable), PostgreSQL, sparklyr, SparkR, MonetDBLite, and (and with non-window functionality with RSQLite). It can target various databases through its adapter layer. To install: devtools::install_github("WinVector/rquery") or install.packages("rquery"). Note: rquery is a “database first” design. This means choices are made that favor database implementation. These include: capturing the entire calculation prior to doing any work (and using recursive methods to inspect this object, which can limit the calculation depth to under 1000 steps at a time), preferring “tame column names” (which isn’t a bad idea in R anyway as columns and variables are often seen as cousins), and not preserving row or column order (or supporting numeric column indexing). Also, rquery does have a fast in-memory implementation: rqdatatable (thanks to the data.table package), so one can in fact use rquery without a database. rquery can be an excellent advanced SQL training tool (it shows how to build some very deep SQL by composing rquery operators). Currently rquery is biased towards the Spark and PostgeSQL SQL dialects. 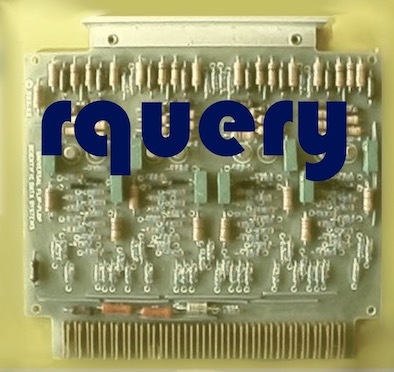 rquery is realized as a thin translation to an underlying SQL provider. We are trying to put the Codd relational operators front and center (using the original naming, and back-porting SQL progress such as window functions to the appropriate relational operator). extend(). Extend adds derived columns to a relation table. With a sufficiently powerful SQL provider this includes ordered and partitioned window functions. This operator also includes built-in seplyr-style assignment partitioning. extend() can also alter existing columns, though we note this is not always a relational operation (it can lose row uniqueness). project(). Project is usually portrayed as the equivalent to column selection, though the original definition includes aggregation. In our opinion the original relational nature of the operator is best captured by moving SQL’s “GROUP BY” aggregation functionality. natural_join(). This a specialized relational join operator, using all common columns as an equi-join condition. theta_join(). This is the relational join operator allowing an arbitrary matching predicate. select_rows(). This is Codd’s relational row selection. Obviously select alone is an over-used and now ambiguous term (for example: it is already used as the “doit” verb in SQL and the column selector in dplyr). rename_columns(). This operator renames sets of columns. set_indicator(). This operator produces a new column indicating set membership of a named column. (Note rquery prior to version 1.2.1 used a _nse() suffix yielding commands such as extend_nse() instead of the newer extend() shown here). select_columns(). This allows choice of columns (central to SQL), but is not a relational operator as it can damage row-uniqueness. orderby(). Row order is not a concept in the relational algebra (and also not maintained in most SQL implementations). This operator is only useful when used with its limit= option, or as the last step as data comes out of the relation store and is moved to R (where row-order is usually maintained). map_column_values() re-map values in columns (very useful for re-coding data, currently implemented as a sql_node()). pick_top_k(). Pick top k rows per group given a row ordering. assign_slice(). Conditionally assign sets of rows and columns a scalar value. if_else_op(). Simulate simultaneous if/else assignments. rquery also has implementation helpers for building both SQL-nodes (nodes that are just SQL expressions) and non-SQL-nodes (nodes that are general functions of their input data values). One of the principles of rquery is to prefer expressive nodes, and not depend on complicated in-node expressions. A great benefit of Codd’s relational algebra is it gives one concepts to decompose complex data transformations into sequences of simpler transformations. SQL’s realization of sequencing as nested function composition. SQL uses some relational concepts as steps, others as modifiers and predicates. 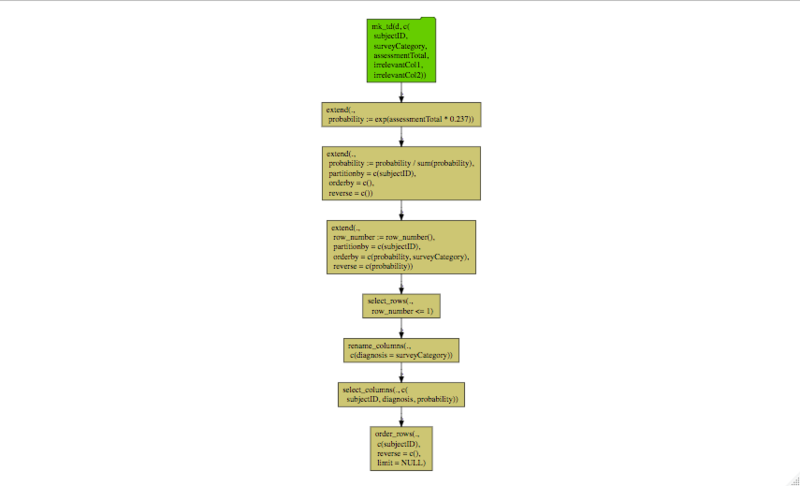 Let’s work a non-trivial example: the dplyr pipeline from Let’s Have Some Sympathy For The Part-time R User. ##   RS-DBI driver: (could not Retrieve the result : ERROR:  syntax error at or near "INT"
##  "table(\"d\"; subjectID, surveyCategory, assessmentTotal, irrelevantCol1, irrelevantCol2)"
Note: in examples we use rq_copy_to() to create data. This is only for the purpose of having easy portable examples. With big data the data is usually already in the remote database or Spark system. The task is almost always to connect and work with this pre-existing remote data and the method to do this is db_td(), which builds a reference to a remote table given the table name. The suggested pattern for working with remote tables is to get inputs via db_td() and land remote results with materialze(). To work with local data one can copy data from memory to the database with rq_copy_to() and bring back results with execute() (though be aware operation on remote non-memory data is rquery’s primary intent). ##  $ surveyCategory : chr  "withdrawal behavior" "positive re-framing" "withdrawal behavior" "positive re-framing"
##  $ irrelevantCol1 : chr  "irrel1" "irrel1" "irrel1" "irrel1"
##  $ irrelevantCol2 : chr  "irrel2" "irrel2" "irrel2" "irrel2"
Now we re-write the original calculation in terms of the rquery SQL generating operators. ##  "table(\"rquery_mat_36951575415185691193_0000000000\"; subjectID, diagnosis, probability)"
We see we have quickly reproduced the original result using the new database operators. This means such a calculation could easily be performed at a “big data” scale (using a database or Spark; in this case we would not take the results back, but instead use CREATE TABLE tname AS to build a remote materialized view of the results). A bonus is, thanks to data.table and the rqdatatable packages we can run the exact same operator pipeline on local data. Notice we applied the pipeline by piping data into it. This ability is a feature of the dot arrow pipe we are using here. row_number ( ) OVER (  PARTITION BY "subjectID" ORDER BY "probability" DESC, "surveyCategory" ) AS "row_number"
"probability" / sum ( "probability" ) OVER (  PARTITION BY "subjectID" ) AS "probability"
exp ( "assessmentTotal" * 0.237 )  AS "probability"
) tsql_23924192728593473818_0000000006 ORDER BY "subjectID"
The query is large, but due to its regular structure it should be very amenable to query optimization. A feature to notice is: the query was automatically restricted to just columns actually needed from the source table to complete the calculation. This has the possibility of decreasing data volume and greatly speeding up query performance. Our initial experiments show rquery narrowed queries to be twice as fast as un-narrowed dplyr on a synthetic problem simulating large disk-based queries. We think if we connected directly to Spark’s relational operators (avoiding the SQL layer) we may be able to achieve even faster performance. rquery also includes a number of useful utilities (both as nodes and as functions). We have found most big-data projects either require joining very many tables (something rquery join planners help with, please see here and here) or they require working with wide data-marts (where rquery query narrowing helps, please see here). We can also stand rquery up on non-DBI sources such as SparkR and also data.table. The data.table adapter is being developed in the rqdatatable package, and can be quite fast. Notice the examples in this mode all essentially use the same query pipeline, the user can choose where to apply it: in memory (data.table), in a DBI database (PostgreSQL, Sparklyr), and with even non-DBI systems (SparkR). To install rquery please try install.packages("rquery").